In order to properly enumerate the best decision for investing in an of shore industry, it is important to assess a risk analysis for the industry of choice. For this problem, the Beta test was chosen as the tool for the targeted analysis. 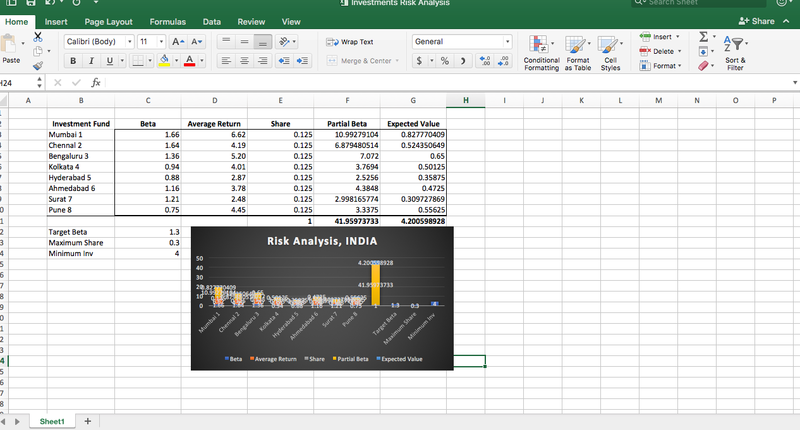 The visualization shows the target Beta and the expected value, armed with this profile, the decision to invest is positive. Taking a closer look, five cities out of the eight, in India, have an average return higher than 4 percent representing a total around twenty four percent. However, the risk involved is based on the overall market, if the market drops, the Beta will decrease to a negative 13. Needless to say, in the entertainment industry, "the show must go on". The recommendation, invest in the Indian Entertainment Market.